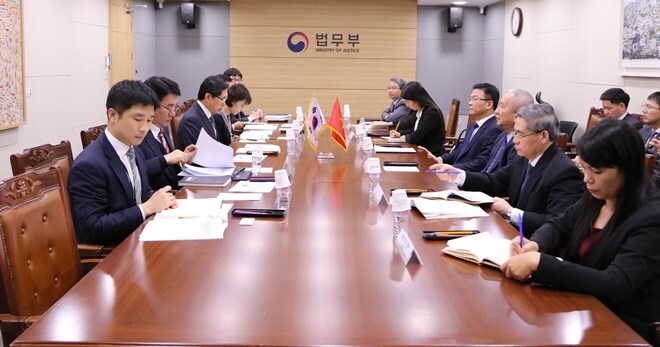 Seoul (VNA) – Vietnamese Minister of Justice Le Thanh Long had a working session with his Korean counterpart Park Sang-ki in Gwacheon city on April 1, discussing measures to enhance cooperation between the two ministries in the coming time. The Vietnamese ministry wants to boost collaboration in law and justice between the two countries as well as the two ministries, Minister Long affirmed, adding that under a Memorandum of Understanding (MoU) between the two ministries signed in 2015, both sides have conducted numerous delegation exchanges. He expressed his hope that the MoU will be carried out in a more effective manner to boost mutual understanding as well as experience sharing in law-related fields. He wished that the two justice academies, set up under the two ministries, will enhance connections and have practical activities in jurist training. In addition, he suggested both ministries outline specific cooperation activities as well as build a collaborative plan for 2019-2020. Regarding mutual legal assistance, Minister Long said that two rounds of negotiations on an agreement on mutual judicial assistance in civil and commercial matters were conducted between the two ministries, hoping that both sides will accelerate further the negotiation process so that the agreement will be signed as soon as possible as the number of judicial entrustments between Vietnam and the Republic of Korea (RoK) have increased in recent years. Long took the occasion to ask the RoK Government to create favourable conditions for Vietnamese people living and working in the host nation. The same day in Sejong city, Minister Long had a meeting with RoK Minister of Government Legislation Kim Oe-sook, during which he introduced the host his ministry’s organisation and its role in law management and making in Vietnam. Both ministries have certain similarities, thus they can share experience with each other, he suggested, adding that both sides should step up the implementation of their MoU signed in 2012 to further bilateral cooperation. Kim, for her part, laid stress on the RoK’s New Southern Policy, which strengthens relations with ASEAN member states, including Vietnam.